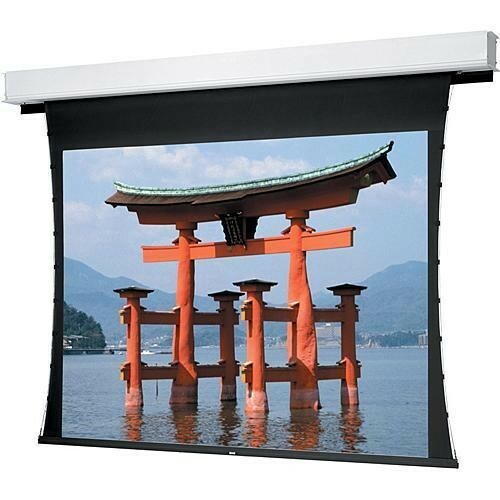 This Tensioned Large Advantage Deluxe Electrol 16:10 Wide Format Motorized Projection Screen from Da-Lite has a 120.0 x 192.0" viewing area with a DA-Mat HC flame retardant and mildew-resistant finish. With its 0.8 Gain rating and 45° (L/R) viewing angle, this special gray finish is optimized for use with LCD, DLP and D-ILA projectors. By lowering the black levels of the projection, the image will appear more film-like. DA-Mat HC is good choice when ambient room light can be controlled and video is the dominant projected source. If the finish becomes soiled, it can be cleaned with mild soap and water. Tensioning on each side of the seamless fabric assures a flat, undistorted surface that eliminates any chance of a skewed image. This finish comes with black backing for opacity and standard black masking borders. One of the major advantages of this screen is that the fabric roller can either be factory installed or at your chosen location after the ceiling recessed, UL Plenum rated extruded aluminum white housing has been roughed in. The enables you to finish the initial installation but choose your screen finish at a later date. It should be noted that this version of the screen has a wider casing to accommodate a larger roller. The screen includes two motors; one for the ceiling door and one for the fabric. The interior roller features a quick reversal motor, oiled for life, with automatic thermal overload cutout, integral gears, capacitor, and an electric brake to prevent coasting when the screen is stopped at a chosen length. The built-in Low Voltage Control controls up/down and stop functions using the included 12VDC three-position switch that can be wall mounted where convenient. It can also be operated from an optional radio frequency, infrared or auxiliary transmitter. Box Dimensions (LxWxH) 23.0 x 18.0 x 0.0"